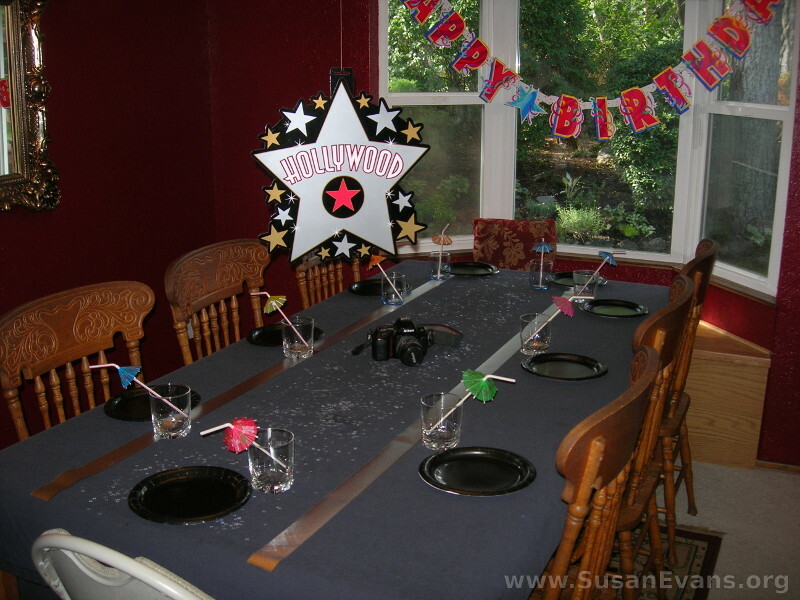 If you want to throw an old-fashioned movie birthday party, you have come to the right place! I will show you how to make a cake in the shape of an old movie camera. 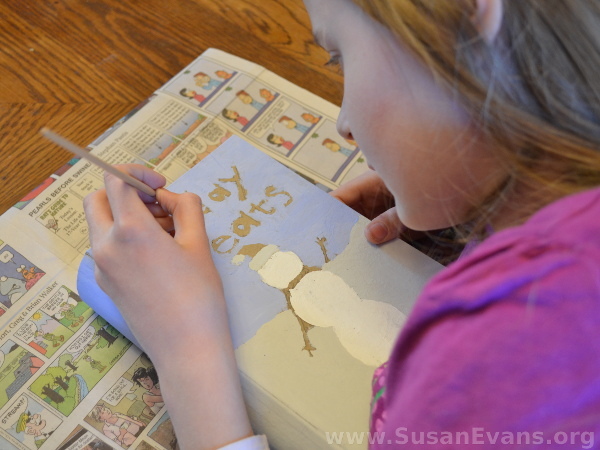 I will also tell you about some activities you can do for a movie party, besides watching a movie! 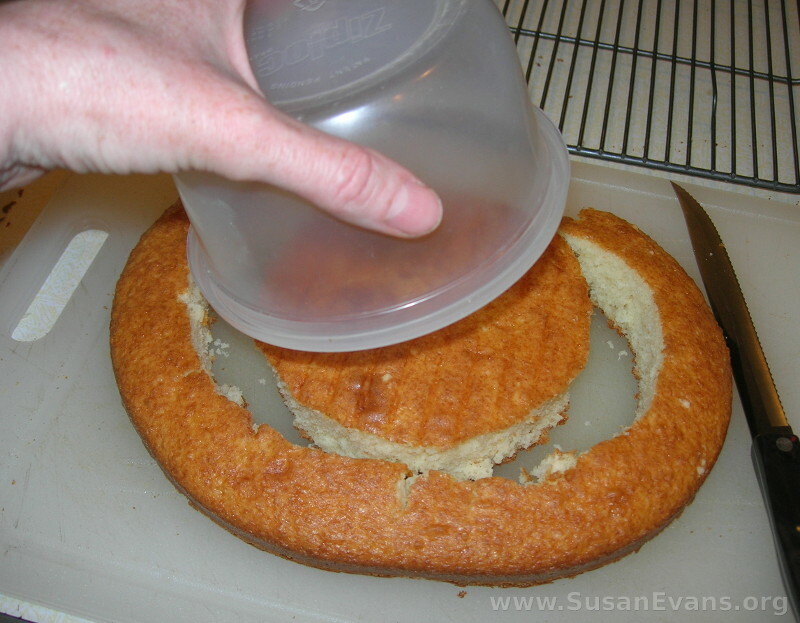 I wanted the circles on the top of the cake to be smaller than a cake pan, so I used a round plastic container as a cookie cutter. The finished cake is at the top of this post. I found some large letter stickers at a hobby supply store, and I stuck them down on white card stock paper and taped them to toothpicks before stabbing them into the cake. 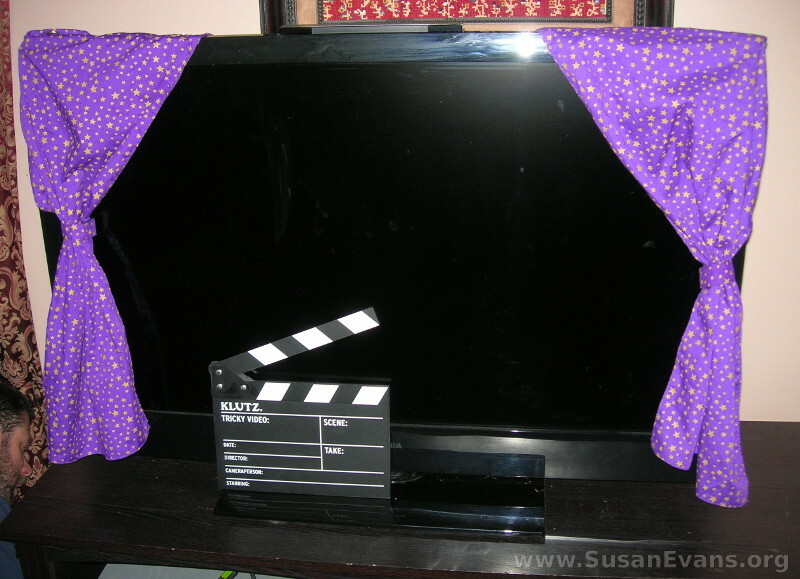 You can tape curtains to the sides of your television. We used the curtains from our puppet theater, but you can just hang some cloth and tie the sides. No sewing is required. I found a movie gadget that opens and closes for the scenes being filmed. I bought it at a party supply store. We used it for the skits described in the activity below. I also found some Hollywood decorations at a party supply store, which I hung from the chandelier, but you could just cut out a silver star out of card stock paper. I had silver star confetti and silver streamers. I placed a black bed sheet on the table, and the silver streamers ran down the sides. A camera was placed in the middle of the table on top of the confetti. 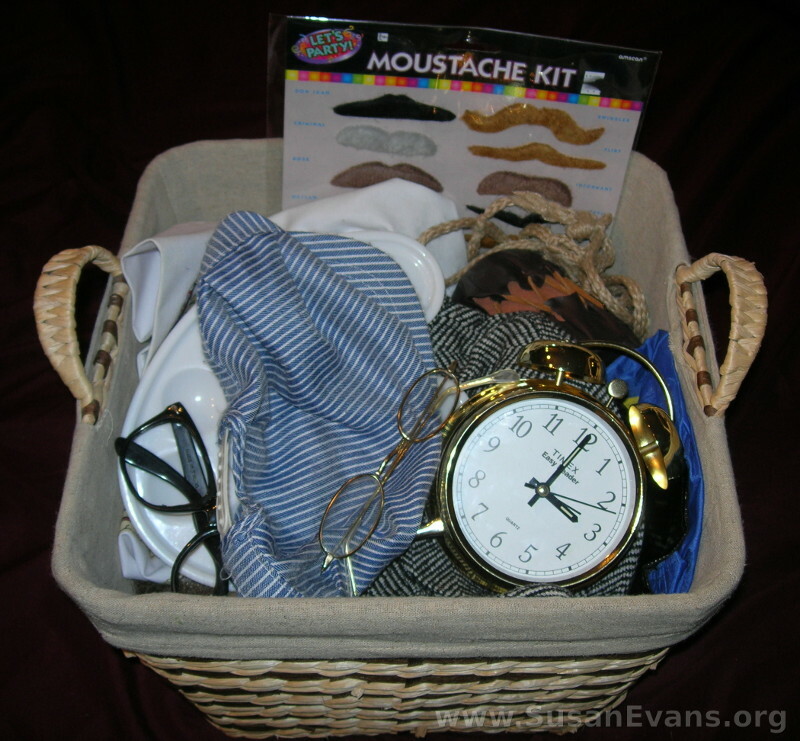 Grab a basket or dress-up box and place different hats, scarves, glasses, and other accessories into it. (We found some stick-on moustaches at a costume shop!) The kids can break into teams and practice a fun skit with the materials in the basket. Then they can present it to the audience. You can film the skits. 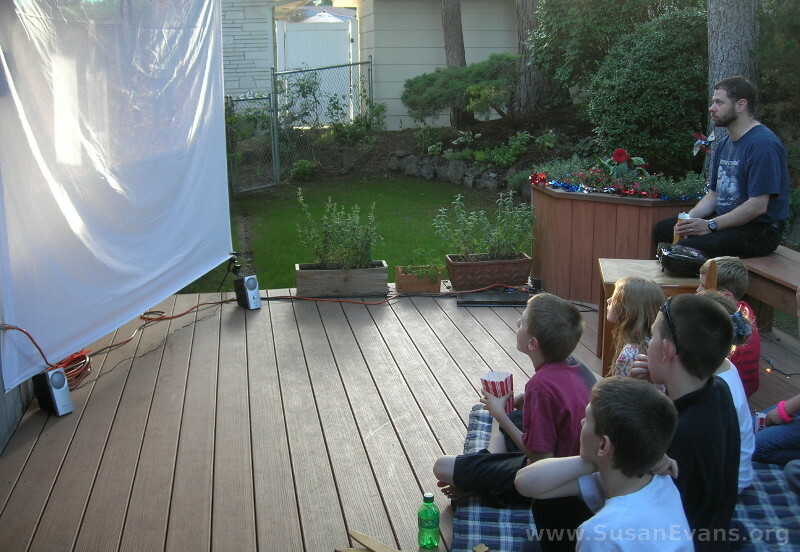 During the second half of the party, we watched an outdoor movie. If you don’t have a projector, you can watch the movie indoors on your television. We hung a sheet outside and used the projector from my speaking engagements, and we watched “The Princess Bride” outside. 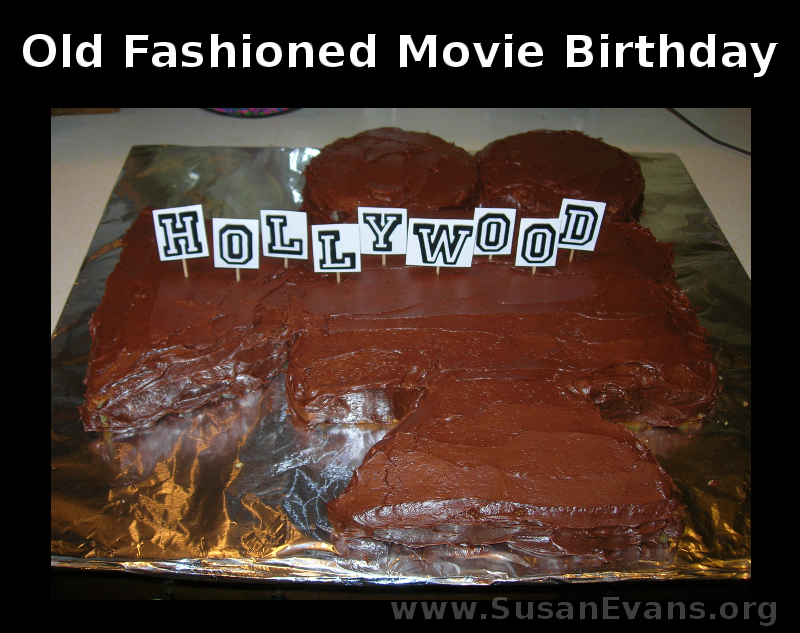 We had a great time at our old fashioned movie birthday party! 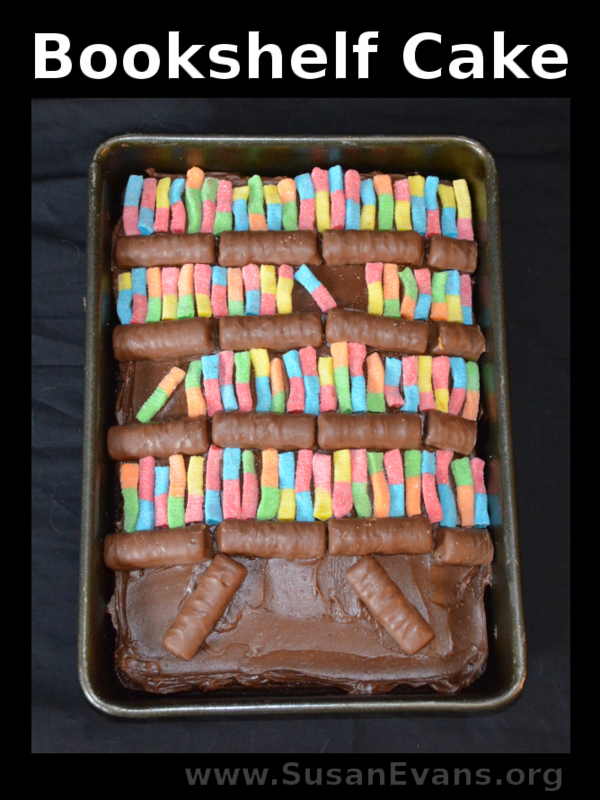 This calculator cake is super easy to make and is perfect for a nerd, a math teacher, or anyone who enjoys math. 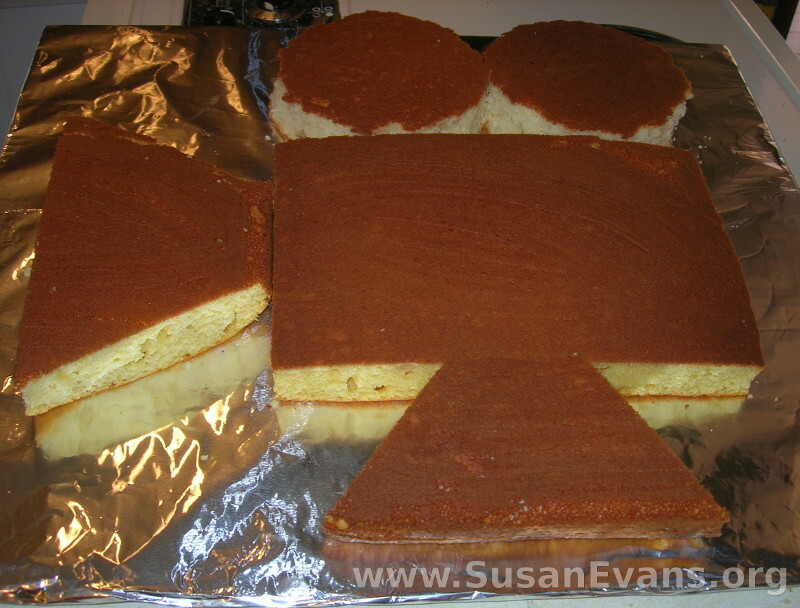 All you do is bake a rectangular cake in whatever flavor you want. We placed the cake on a piece of cardboard lined with foil and taped at the back. Then we frosted the cake with chocolate frosting. 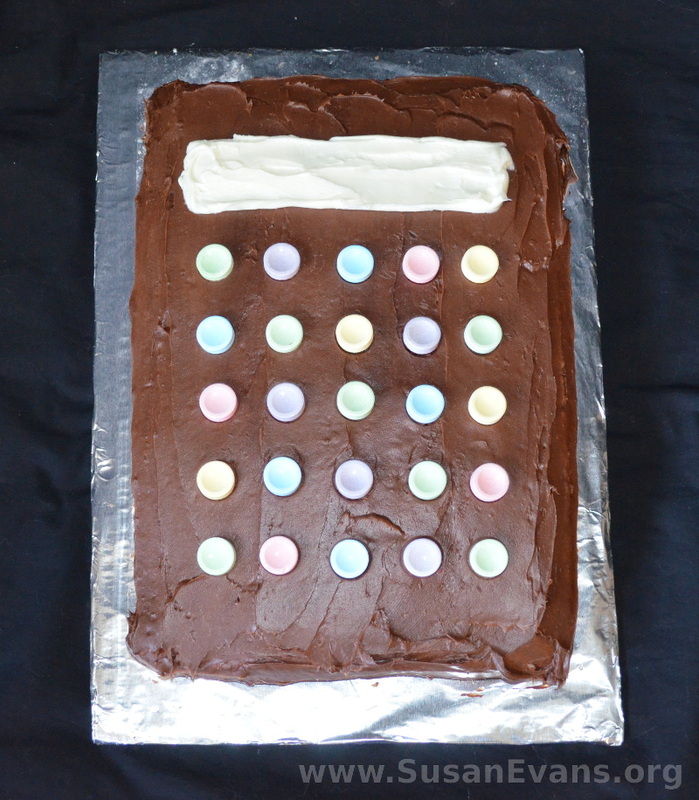 We used white icing for the top rectangle, which is where numbers show up on the screen of the calculator. If you’re clever, you can put some numbers into that rectangle. (For example, 4+4 or something along those lines.) 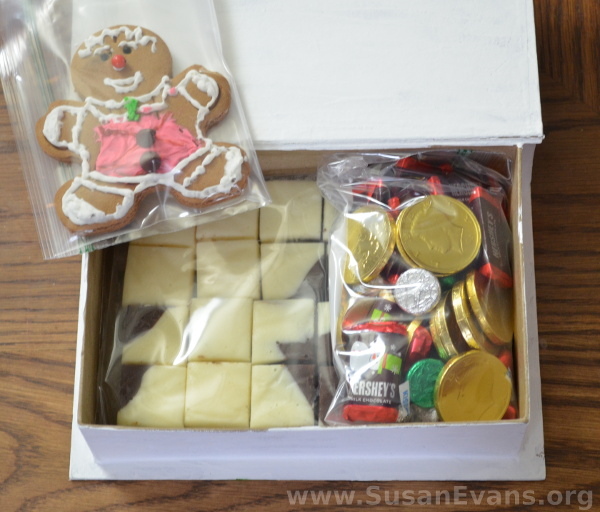 You can find candy numbers in the baking aisle of a grocery store or in the cake supply aisle of a craft store. I left the screen blank because the calculator is off. We used Sweet Tarts for the buttons of the calculator, but you could use any round candy that is about the same size. 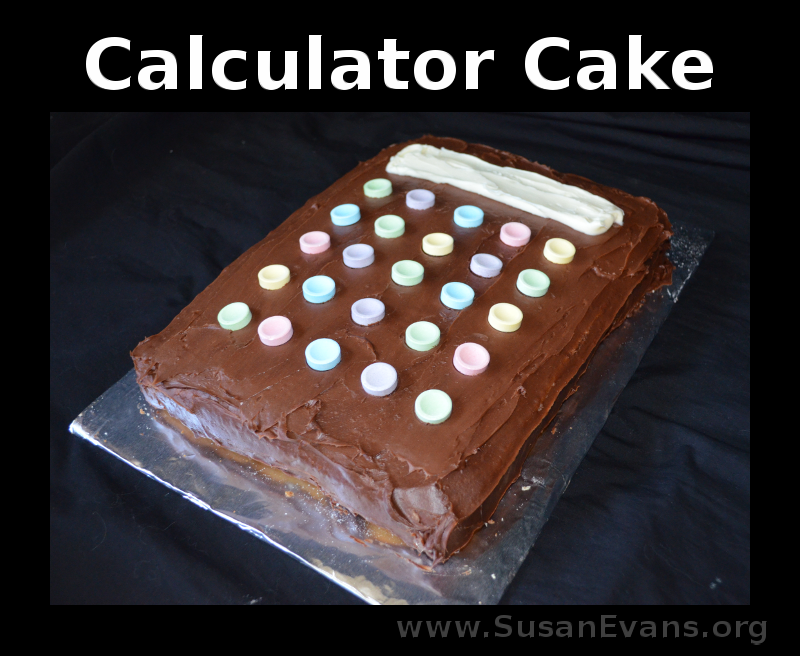 Now your calculator cake is complete. Give it so someone you love and stand back and watch the amazement in their eyes as you present them with an edible calculator! This bookshelf cake is perfect for book lovers and librarians. Anyone who enjoys reading books would appreciate this themed cake for his or her birthday. 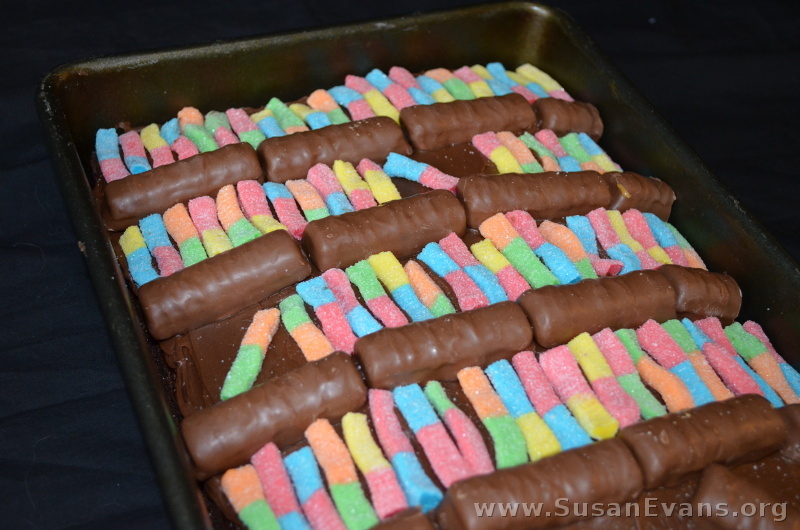 First you will want to bake a rectangular cake, preferably chocolate. Next you will want to frost the cake with chocolate frosting. Most bookshelves are wooden, so brown is the perfect color for the background of your bookshelf. Now comes the fun part. 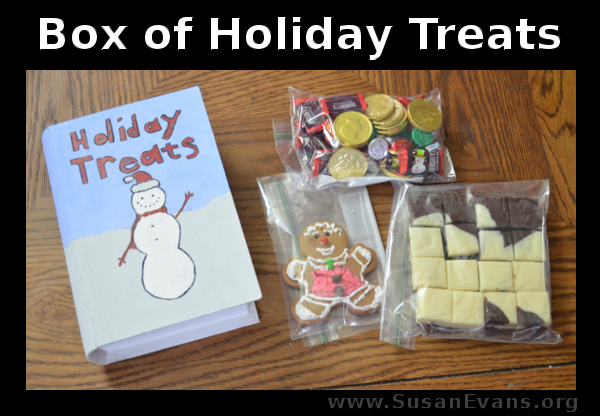 Buy candy to represent the shelving and the books on the shelves. I spent a full week trying to find candy that would look like books. I finally settled on sour worms. We cut off the rounded tops and bottoms of each sour worm to make the books look more realistic, since the tops and bottoms of books are squared off. I used Twix chocolate for the brown shelving, and I created four shelves on which to place the sour worm books. I obviously placed the Twix down first, and then I placed the books on each shelf. I tilted a couple of books to make the bookshelf look more realistic. I also slanted two Twix at the bottom of the shelf to represent the feet of the bookshelf. Didn’t it come out great?